The LOWEdown | The Official Blog of Casey Lowe. 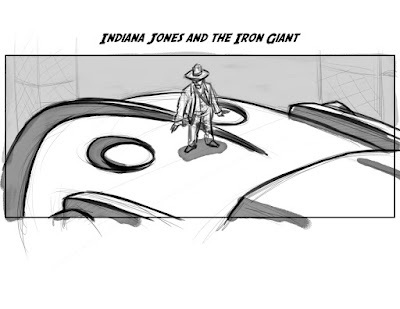 : Indiana Jones and the...Iron Giant? 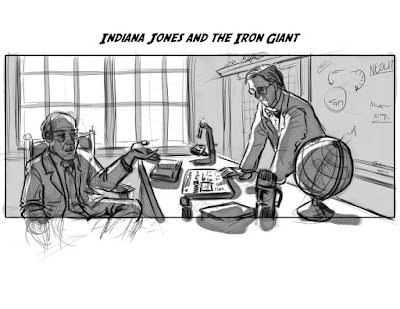 Indiana Jones and the...Iron Giant? Now this is an interesting one. 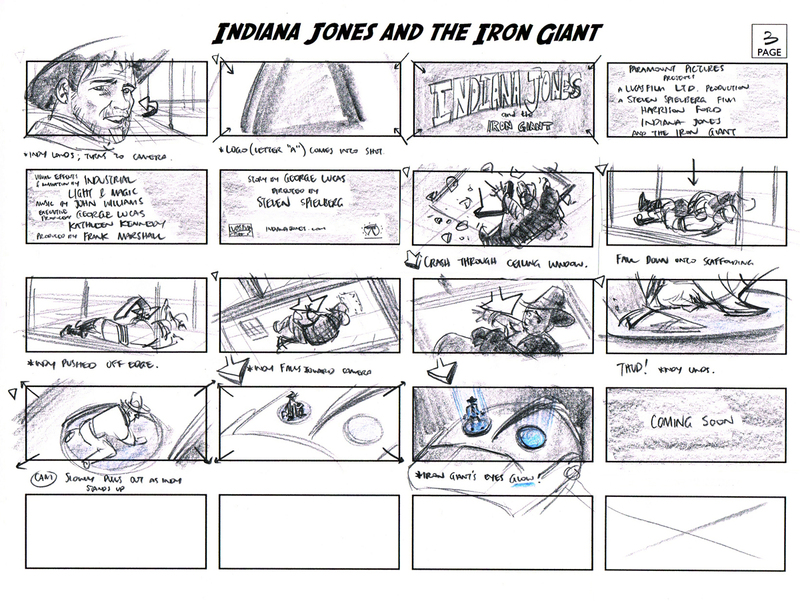 For my Advanced Storyboarding class, we had to take two different movies and do a Glee-style mash-up! Well, I suppose it really has nothing to do with Glee, but my group chose the classic Indiana Jones and the brilliant Iron Giant. We then had to develop a storyline that would weave these two worlds together. 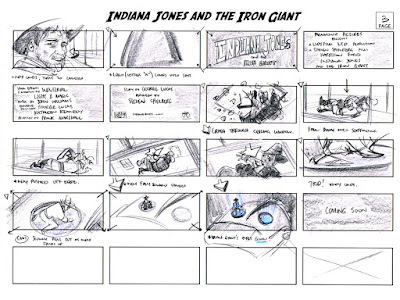 The assignment itself, then, was to create a trailer for this new film. 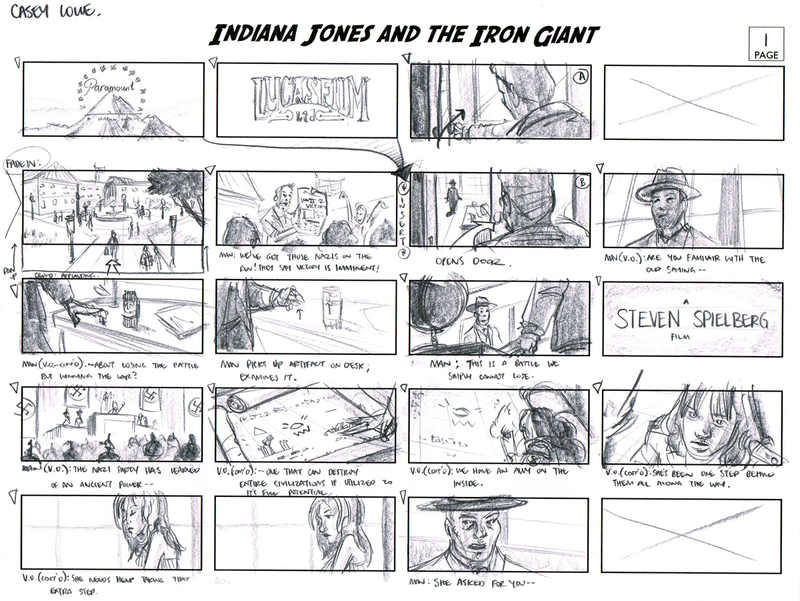 Granted, movie trailers are never storyboarded (unless it's some sort of teaser trailer featuring new, exclusive footage), so it's kind of an odd idea to storyboard a trailer. 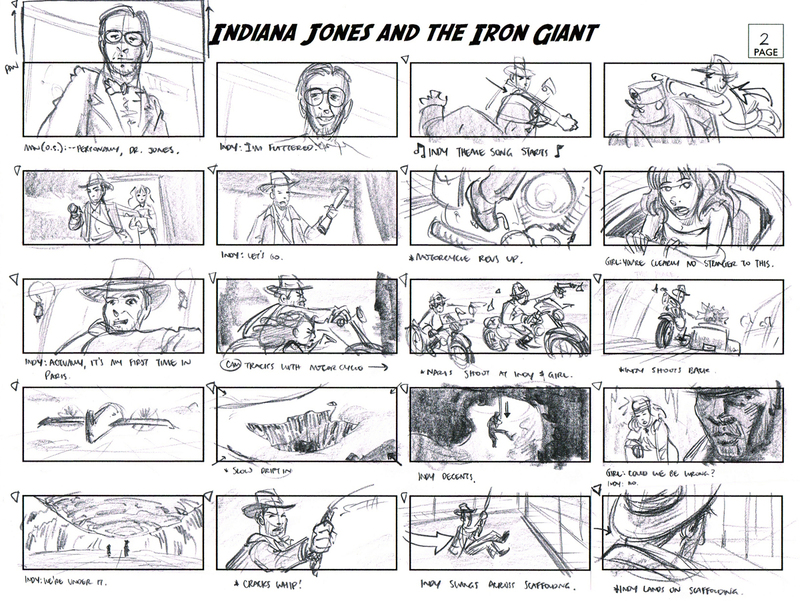 Still a fairly fun process. Indiana Jones is a professor at Marshall College in Connecticut. We see him heading to his classroom holding a newspaper; headline reads “Victory in Europe Close”. Jones enters his office to find a U.S. Government Agent awaiting his arrival. The Agent informs him that, while victory may seem close, they have learned of the Nazi’s final, Hail Mary pass: they are constructing an Iron Giant. An ally believes that she has discovered the location of an ancient power source that the Nazi’s need to acquire to power their Iron Giant. Jones is sent to war-torn Paris, France, where he is paired with a cynical, fiery redheaded symbologist. She explains that the Nazi’s have been deeply studying ancient symbols and legends that tell of a mystical power source that could wipe out entire civilizations. Using their combined knowledge, the two decipher the location of the mystical power source, but discover too late that they are being watched. A motorcycle chase commences with the two proving themselves victorious in escaping. The two unlikely heroes next head to the Arctic. Here, they find the mystical power source, only to have it taken from them by the overpowering Nazi soldiers that have tailed them. The two are left to freeze to death, but wittily escape certain doom. With the Nazis now in possession of the ancient power source, Jones and the Symbologist have no choice but to head to the heart of Germany, deep into the Nazi stronghold. 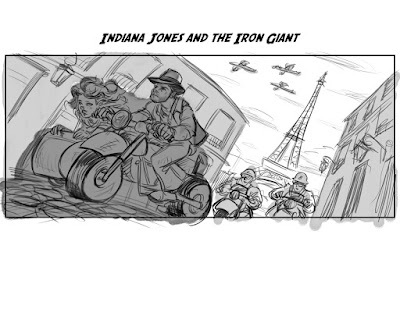 It is here that they discover the already-­‐built Iron Giant, now being powered by the mystic power and ready to defeat the Allied Forces. Can Indiana Jones stop this menace before it’s too late?? 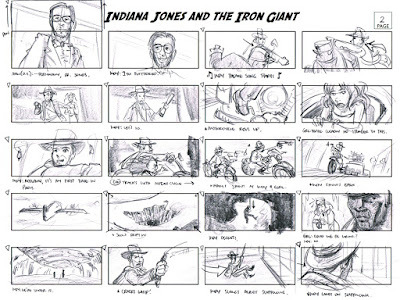 Indiana Jones TM & © 1981-2012 Lucasfilm Ltd.
Iron Giant TM & © Warner Bros.